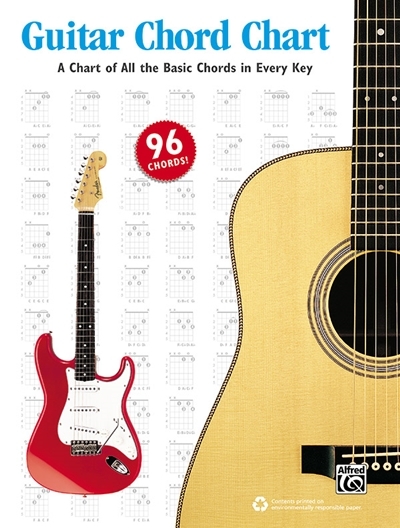 This convenient chord chart lists all the basic guitar chords in every key. All chords are clearly shown using chord frames that indicate frets, fingerings, and the note names in every chord. Major, minor, seventh, diminished, augmented, major 6th, minor 6th, and 9th chords are given. A chord accompaniment guide is included that shows the three principal chords, the relative minor chords, and alternate chords for each key.